Life is a book of volumes three. The past, the present, and yet to be. The first is finished and laid away. The second we're reading day by day. is locked from sight - God holds the key. This is a tale of two churches. 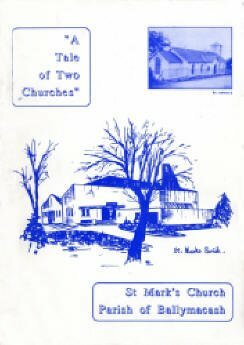 1992 is the centenary of the dedication of 'the old church on the hill' much loved by many of the older parishioners and the 25th anniversary of the Parish of St Mark, Ballymacash, becoming an independent cure. In 1975 the new church was built. We do well to remember that the feast of the Dedication of a church is a Feast of the Lord and His people - not a celebration of a building. The Church is the Body of Christ, the New Israel, the people of God, people like you and me and not bricks and mortar. Ballymacash is enriched by the publication of this booklet. As a result we are made more aware of our surroundings and the people whose fellowship in Christ we share and enjoy, the community in which we live and our fellow parishioners. Many people greatly appreciate the atmosphere of the modern church building geared for liturgical renewal. History reminds us that the present has evolved through generations who worshipped in quite a different atmosphere of the nearby older church. However nothing stands still and change is a fact of life. Ballymacash has a past and a present. It also will have a future, under God, as we move into the 21st century and no doubt change will continue to be the order of the day. I hope that all who read the Ballymacash Story will be inspired to a deeper sense of worship, witness and service in Christ who is the One who has brought together so many in this growing community. 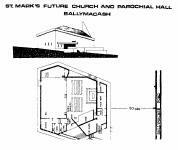 By happy coincidence the year 1992 marks two significant milestones in the history of St Mark's, Ballymacash - the centenary of the original St Mark's Church on the Nettlehill Road and the 25th anniversary of the district of Ballymacash being raised to the status of a separate parish. Mr Brian Kelly has made a very personal and profound. contribution to the celebration of these anniversaries in producing this booklet which represents many months of careful research. It is the inspiring story of the parishioners' spiritual commitment, generosity and sustained effort, and one which will bring encouragement to those privileged to be part of that same continuing story today. I commend this booklet with the hope that it may not only interest you, but that you may be inspired by the record of the zeal, devotion and self-sacrifice of past generations. I trust that our thankfulness for the heritage we have received will be accompanied by a strengthening of our loyalty to Christ and a faithful stewardship of the resources entrusted to us. Born out of the ancient Parish of Derriaghy founded on a site which dates back to AD 1444 and the Chapel of Air ear a chaid, the area of Ballymacash served by St Mark's and its history, is to all intents and purposes a reflection or mirror image of the town of Lisburn over the past century, growing much in step with the developments of the town itself and on a scale which few would have believed possible a hundred years ago. Although Lisburn was recognised as one of the most prosperous towns in the province at the turn of the century, it has without doubt maintained its stature as the dawning of a new century approaches with major international retailers acknowledging its potential and setting up an operation in the town. Situated in the southern part of the Parish of Derriaghy which was bounded on the south-east by the Lagan Canal, the area developed at a rate which placed considerable pressure on the accommodation which was available in the Ballymacash area. The speed at which these developments were taking place can be appropriately described in the conversation which Rev Mervyn McCullagh, the district's first curate assistant had with a local resident when he arrived. He enquired as to the name of the particular new housing estate. "I'm sorry but we haven't given it one yet!" came the reply. And the main road? asked the curate assistant. "Oh that hasn't been named either! " To fully appreciate, however, the extent to which the area has changed over the past century one must first acknowledge the part which Canon Joseph Atkinson Stewart played with over fifty years of devotion to the Church in the Parish of Derriaghy. He was responsible for the building of the Chapel of Ease in Ballymacash in 1892 having earlier provided substantial financial support to the Mission Hall in which services had previously been held. Canon Stewart moved from Pond Park House to Killowen House (now better known as Killowen Hospital) on the Ballymacash Road. He provided employment for a great many people resident in the immediate locality and it would be fair to suggest that there were very few who worked in the district who did not have some connections with the House at the end of the 19th and the beginning of the 20th Century. A curate in Derriaghy from 1862-63 he returned in 1866 for a second stint remaining until 1915. 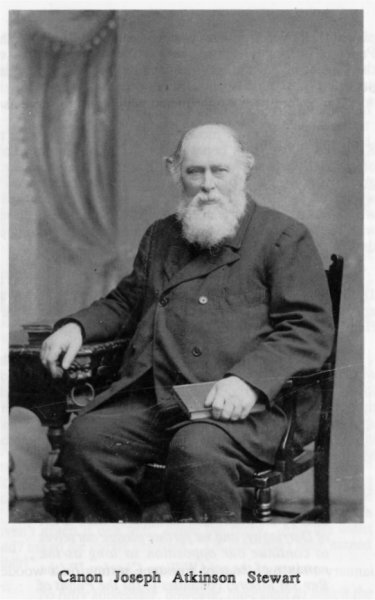 He was appointed Canon of Kilroot in 1908 and was the son of Rev Henry Stewart, Rector of Derriaghy who died in 1872. 'solemnly pledge ourselves to use every legitimate means to frustrate the designs of William Charley JP and his colleagues to destroy the peace and harmony of the Parish of Derriaghy; and we further pledge ourselves to continue our opposition so long as the nominee of the said William Charley JP (the Rev SM Moore) continues to fill the Pulpit of our Parish Church." It was reported that one of his first gifts to Derriaghy Parish was an organ chamber while further generosity was shown when he supplied a teacher for Castlerobin Primary School which he changed from a cottage he had rented from the Waring family at Aughrim and which was to serve as a school for some seventy years. Although a pension scheme is very much part of our working lives today it was of course not always the case and it is reported that he, at his own expense, maintained a pension scheme for the aged in the district. Canon Stewart who died in 1915 left an estate worth £10,7788 is 9d. The Parish has grown at a dramatic rate is perhaps an understatement. From the old Church on the hill dedicated in 1892 and serving a few well scattered houses in what was a decidedly rural community. Some fifty years earlier it should be recalled there were reportedly only 1071 houses in the town of Lisburn which had a population of 7,524. The original building was dedicated for Divine Worship as a Chapel of Ease by the Lord Bishop of the Diocese Rev Thos I Welland on 5 April 1892 to accommodate around one hundred worshipper in this particular district of Derriaghy Parish, and to replace the Ballymacash Mission in which regular services had been held. Built on Nettle Hill, the Chapel of Ease was of a rectangular shape. The pulpit, acquired from Stoneyford Church, was presented to the Chapel by Mr Stewart in 1900. This required slight alteration in order to suit the Chapel. The font of neat pine wood was purchased by Rev Stewart from Scott & Co of Dublin. This was later replaced in January 1948 by a font of freestone resting on a wooden stand. This font was sited at the front of the Church on the east side beside the choir stalls. The seating in the old church was of pitch pine and presented by R Brown. The first Sunday service was held on 10 April 1892 with Rev W Riddell the preacher in the morning and the Rev Joseph A Stewart the preacher in the evening. The Church was, however, closed for repairs for a period at the turn of the century and at the re-opening service on 19 October 1902 when Rev Riddell was again the preacher, Rev Stewart read a document from the Lord Bishop appointing and authorizing 'that henceforth this said building should be designated the Church of St Mark in the Parish of Derriaghy'. Painted and repaired in 1920 the church was to be further extended in 1954 and consecrated by the Lord Bishop of Connor Dr Charles King Irwin on 15 September 1954. The address was given by Canon CJ McLeod, Rector of Christ Church. Before the service Clergy walked in procession to the Church and were received at the entrance by the incumbent Rev PAG Sheppard and churchwardens W Glover and J McKinstry. The Bishop's staff was carried by the Rev RC Ellis Rector of St Colman's, Derriaghy. The extension fund had only begun two years previously. The nave was effectively doubled in length, the vestry increase in size, sanctuary enlarged and tower erected over the old porch at the west end. The sum of £200 was apparently sufficient to erect the old building whereas £2936 was to be spent on the construction of the extension! The old St Mark's Parish Hall is now a small shopping precinct with a general store, hairdressing salon and chip shop. The building was originally built in 1790 and reconstructed in 1833 by Edward Johnson. Used as a School House until the completion of the Ballymacash Primary School in 1932 when it was returned to the Parish, presented by Miss MEK Johnson. Miss Johnson, patron of Ballymacash School transferred the school and grounds to the Diocesan Board of Education around 1920. The Hall was extended around 1950 with a substantial stage erected, committee room built behind the stage while kitchens and toilets were added later. The extension depended on voluntary labour at a cost of around £800. St Mark's though has in more recent times served a more densely populated area. The district of Ballymacash was recognised as a Parish in its own right in January 1967 ... becoming a full incumbency on 1 January 1970 ... to one appointing its first rector Rev TWW Jones, installed on 5 March 1970. In terms of families the growth can be shown when it was estimated that there were no more than 120-130 families in the district associated with St Mark's in the Fifties and early Sixties while this jumped to upwards of 400 in 1974, increasing to 465 when it became an incumbency. Today the figure stands at around 630 families. Before approval for a much needed curate assistant was granted there had been established a close link with Stoneyford Parish. Rev F Graham was appointed as minister in charge of Stoneyford and curate assistant of the temporary grouping of Ballymacash and Stoneyford Parishes and he was of considerable support particularly during the periods when Rev Jones was unable to fulfil his duties with his normal enthusiasm due to illness. It was later agreed that a full-time curate assistant could be appointed and Rev Mervyn McCullagh (1983-85), Rev Paul Hewitt (1986-89) and more recently Rev Tom Gordon (1989-date) have each made a considerable impact during their albeit short ministries with us. 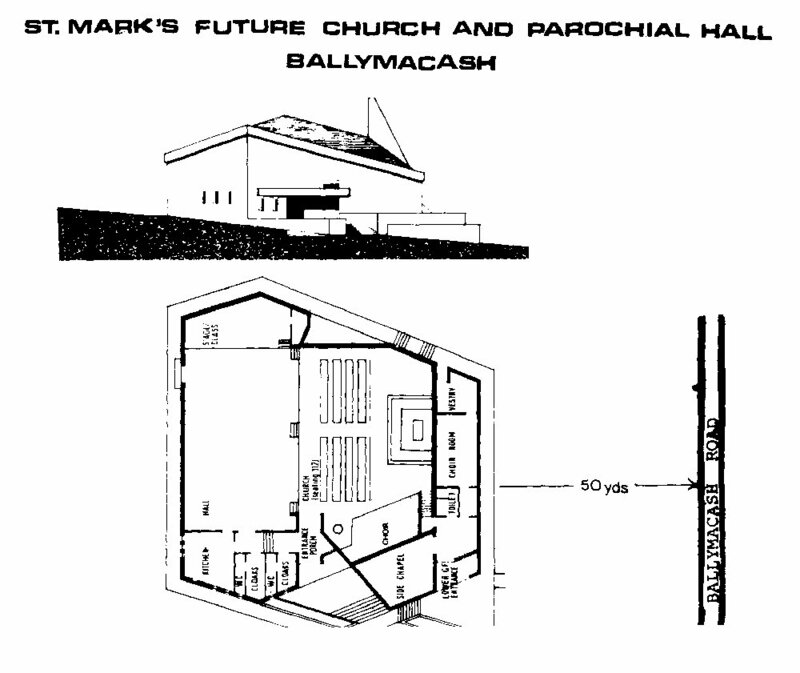 The forethought and energies of the parishioners cannot have been underestimated throughout the past hundred years as they have shown outstanding enthusiasm in seeing their ideas through to fruition, at first with the church on the hill, through to its extension and consecration on 15 September 1954 to the mammoth undertaking the Select Vestry planned in terms of a new church and hall in the 1970s and then to the Canon Jones Hall which provided the much needed facilities of a Parish of this size in 1987. The present Church and its facilities were required to meet the growng demands of the parishioners as the immediate area saw rapid growth and expansion with housing estates being built by both private and public bodies. 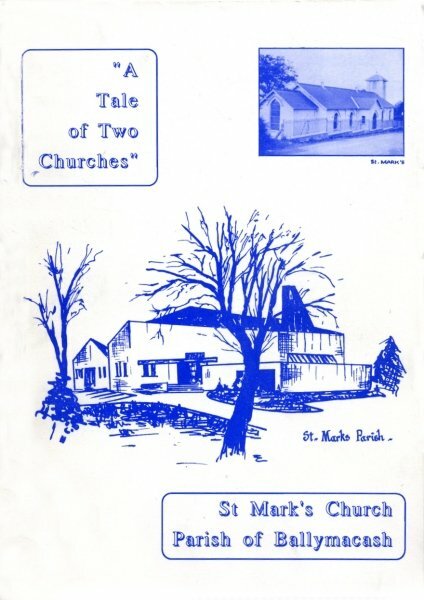 However it must be fully realised that while many have come into the district over the past twenty-one years and set up home within the parish boundaries there has also been a significant number of people who have sadly left the parish to further their education and careers outside St Mark's and I am sure with the publication of this booklet covering principally the past 21 years that many of those who have remained in the Parish will be able to recollect the many characters who remain part of the history of the Parish. Perhaps one of the greatest achievements of the Parish of St Mark at this point in time is the undoubted resolve, energy and leadership qualities of those who have been associated with the parish either its clergy, its organisations or its parishioners who have contributed so much by following and supporting the leadership which have taken so many important decisions over the past hundred years in order to secure the quality of worship in the Parish of St Mark in Ballymacash. The words used by Rev TF Callan reproduced below are particularly appropriate in St Mark's at this time as we celebrate the 21st Anniversary of becoming a full incumbency. Next year will also see the Centenary of the dedication of the much loved Chapel of Ease and the 25th Anniversary of becoming an independent Parish. "We cannot keep the names and personalities that we revere alive beyond the generation that knew them. What we can do is to make sure that the children of today and the children yet to be bored, shall be proud of their inheritance. We can teach that that the freedom into which and the supreme values of the way of life which is their birthright are there because of their forbearers"
Without the enthusiasm, vitality and commitment shown towards the Word of God in this district of Ballymacash the Parish which today is nigh on ?00 families strong could not have reached its present status. Today's Church and Halls are nothing more than a fine testimony to those who have participated in and contributed to St Mark's. In order to set the scene for the Parish's expansion in the Seventies and Eighties we require to look back into the district's history and it is then relatively simple to realise that there was a firm basis on which the Parish could sustain a rapid influx of parishioners. During research for this historical base the editor found the period 1943-mid 50s particularly appropriate.